The directory lists over 2,200 newsletters and reporters published by over 600 publishers. Size/format: 8.5 x 11, perfect bound, 242p. If you're looking for newsletters dealing with the Internet, for example, these are some of entries you would find. Check in the book or on LawTRIO for more entries. Publ. Co.: The Bureau of National Affairs, Inc.
Began 4/96; 48x/yr. ; $1,048, $829-electronic; 28pp. ; 8.5 x 11; hole-punched; free binder; annual index; back issues avail. ; CCC. 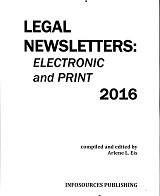 Covers developing law as it concerns electronic information. Main focus is legal issues surrounding content and its distribution in the wide array of electronic formats. Reports on electronic signatures, information licensing, Internet domain name administration, network security, privacy, database protection and more. Available on web. Began 7/95; 2x/yr. ; $42-U.S., $49-foreign; 24-36p. ;8.5 x 11; back issues avail. ; CCC. An update service to The Internet Guide for the Legal Researcher 3rd ed. Covers new developments on the availability of legal resources on the Internet. Began 1/96; l2x/yr. ; $847; 10% disc. for mult. copies; 60-70pp. ; 8.5 x 11; hole-punched; semiannual index; back issues avail. ; reprints avail. ; bk. revs. Documents, pleadings and opinions involving litigation about the Internet. Began 4/96; 12x/yr. ; $199; 12pp. ; 8.5 x 11;hole-punched; annual index; back issues avail. ; reprints avail. ; adv. Useful articles and tips for lawyers using the Internet. Incorporates Legal.online newsletter. "It is as complete and thorough as possible; annotations are short, concise, and helpful. A highly recommended resource." "Each entry contains a wealth of information...a well-organized reference tool that provides extensive information about newsletters...a very worthwhile addition to a reference collection." "This work covers its subject matter in surprising detail...It simply contains so much information that it begs users to come to it with any kind of question. It will virtually always have the answer."